Over the next couple weeks I have several picnics on my calendar. Potato Salad is the quintessential picnic food, so I was pleased to find a hundred-year-old Potato Salad recipe. At first I wasn’t quite sure about the recipe. It didn’t contain the usual Potato Salad ingredients like celery and mayonnaise, but rather was a vinaigrette dressing. Yet, the recipe was so easy that I decided to give it a try. The Potato Salad was lovely, and the vinaigrette dressing with a hint of pepper was just right. It added a delightful flavor to the potatoes, but didn’t overwhelm them. This recipe is a keeper. Peel and dice potatoes into 3/4 inch chunks. Put into a sauce pan, cover with water and bring to a boil. Reduce heat and cook until the potatoes are just barely tender (about 5-7 minutes). Remove from heat and drain. Chill in refrigerator for several hours, then add onions. In a small bowl, combine the olive oil, vinegar, salt and pepper. Pour this dressing over the potatoes and onions. Gently toss to coat the potatoes with the dressing. Put in serving bowl; and, if desired, garnish with parsley sprigs. Posted on August 28, 2016 August 29, 2016 by SherylPosted in FoodTagged potato, recipe, salad. I just had to smile at this-I just made a big batch of Potato salad no more than one hour ago for tomorrow’s lunch! Love it. We must have both been hungry for potato salad. 🙂 August is the perfect time for it. I was also surprised when I read this! Nothing at all like my mom’s with her mayo, mustard, hard boiled eggs and just a tiny bit of pickle relish and sugar. Commercially-made mayonnaise wasn’t yet available a hundred year ago. Old cookbooks did contain recipes for homemade mayonnaise, but I think that it was a little tricky to make – so back then it wasn’t used very often in other recipes. Yes, I was surprised when I saw 9 tablespoons of olive oil, wow! I wonder if that was a typo? It looks like you adapted it quite well. Maybe – it would have been easy for them to make a typo when preparing this church cookbook. 9 tablespoons of oil and 3 potatoes (even if very large potatoes were used) makes no sense. The potatoes would have been just swimming in oil. I like this. Fast and easy with very few ingredients. I like your recipe print option. Is that being offered by wordpress or is it from another source? I found it under Support/Short Codes. It took me a long time digging around. I wonder how long they have had this option. I just notice this on a few other blogs this month. Well I better get started up grading again. LOL…I only have 150 or so to do. I am always flying by the seat of my pants with this blog. A year or two ago a reader wrote a comment and suggested that I use the WordPress formatting. I decided to try it – and have been using it ever since. It took me a couple times to get the format right. I think your idea to pass it on to other users is a good one. I have a recipe for Old Dutch Salad Dressing that I spent time creating a copy cat recipe of the bottle dressing 4 years ago. I had been having trouble finding it. So the last bottle I had I used to taste with until I got it right. I posted the recipe then and now it has all kinds of traffic because the company went out of business. Google has picked up on it this summer. People come to check out the recipe but also look around. That is why I wanted to be able to make a print out option. So I do thank you for waking me up to look for this option. Your comment intrigued me, so I went to your site and found the recipe. The Old Dutch Salad Dressing sounds wonderful. I love sweet/sour dressings. That is how I was taught to make potato salad from my Irish mom. Interesting. . . maybe this is a traditional European way of making potato salad that immigrants brought with them when they came to the US. I love French fries dipped in vinegar with salt and pepper , So I can imagine it is good! Yes, there definitely are some similarities -though one is hot and the other cold. Your comment brings back wonderful memories of eating French Fries with vinegar when I was a child. They were the best French fries I’ve ever had. I think you have recovered a treasure from the past…. 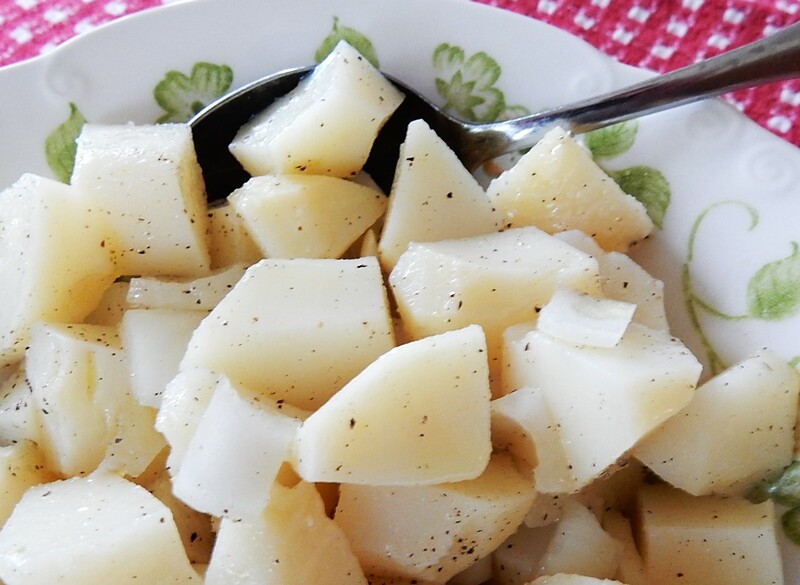 a beautifully simple way to make a delicious potato salad. I went to see the film “Florence Foster Jenkins” yesterday, and at one point in the film, a bathtub filled with potato salad showed up. This recipe would be perfect if you were having to make potato salad in those quantities! Whew- a bathtub full of potato salad is A LOT of potato salad. I may have to go see this movie. Did you like it? I generally like Meryl Streep movies. It was a completely wonderful movie. It was kind toward the unfortunate songstress, who truly was a ghastly singer, and it was humorous throughout. They’ve had to add more showings here, it’s been so popular — and for good reason. Thanks for the info. You’ve convinced me that I definitely need to see it. The movie sounds wonderful. I was surprised how much I liked it. The vinegar and oil was really nice on the potatoes. I don’t know why this is posting before I finish writing! This version of potato salad is new to me. It was new (or perhaps old) to me. 🙂 I’ve also occasionally had problems with the comments posting before I intended. Sometimes I think that I inadvertently hit the “post comment” button too soon and other times it seems like it just happens when I don’t think that I did anything. Ooooooh I’m SO glad you posted this. I had to give up mayonnaise and miss potato salad. This sounds really great! Great recipe and thanks for the wordpress recipe link. You’re welcome – The WordPress recipe formatting has worked well for me. Thanks for letting me know that you made the Poached Egg in a Tomato Recipe. It’s wonderful to hear that you enjoyed it. I really like how you included photos of the entire process. That’s pretty much our family recipe for potato salad, though in our case we substitute chives for raw onion which we find just too harsh in flavour. We often put in a dollop of grainy mustard too. Both are good. I think I’ll make some today! It would be lovely with lemon juice. I usually think potato salad is overrated but this version sounds much more appealing! You should give this version a try. I think that you might like it. Hometown potato salad! Even though I grew up in that area, I don’t think I ever had it that way. Like you, I don’t remember potato salad being made this way when I was a child growing up in central Pennsylvania – though when I made this recipe, there was something about it that brought back wonderful, but very vague, food memories. My surprise came with the ingredient ‘olive oil’ – thought it would have been an exotic, expensive item back then but I guess not. I’d seen advertisements for Pompeian Olive Oil in hundred-year-old magazines (and even posted an old ad for it several years ago), so I knew that it was available back then – but, like you, I was surprised that it was used in this recipe. If you used 2/3 the original recipe with all that oil you could have made homefries with it. Although the 2 tsp vinegar might make it taste a lot different. I can’t figure out why the recipe called for so much oil – and tend to think that there was a typo. The flavor of the dressing would definitely change if the ratio of oil to vinegar was changed. I agree. It could be a typo Maybe it was just 3 TB. They sure knew how to eat back then! I have a home front story coming up soon on how our parents and grandparent ate – it made me chuckle! I think you’ll enjoy it too. Thanks for letting me know about your upcoming post. It sounds really interesting. I’ll have look for it. It’s nice to hear that this post brought back some good memories. I always put a dash of rice vinegar in my potato salad, along with mayo. I’ll have to give it a try without the mayo. Thanks! I love to make potato salad, but it is so calorific … This one wouldn’t be so bad! Very similar to the potato salad that my (Pittsburgh-born) mother makes, however hers includes celery seed and an equal amount of oil and vinegar. Celery seed would be a wonderful addition to this recipe. As I’m sure you know, making recipes using proportions was very common a hundred year ago. It was then easy to adjust the amount made depending upon the size of the group that would be eating the food. Lovely! I think of it as a German potato salad, made with oil and vinegar rather than mayo. But I might have that wrong. I’m in PA Dutch country! (Not that Pennsylvania Dutch people shy away from mayo.) Anyway, it looks simple and delicious! The church that published the cookbook that contained this recipe was located in Lycoming County, and the author of the Potato Salad recipe lived in neighboring Clinton County. These counties are a little northwest of what I using think of as PA Dutch country, but there still would have been a strong German influence. I went to school in Lewisburg, I think not far from Lycoming County. I love your blog. It’s always interesting! It is. Lewisburg is one of my favorite towns. It’s only about 10 miles from where I grew up. It’s great, isn’t it? My daughter goes to Bucknell now. We are often there! It has seen a nice growth of good restaurants and little shops in recent years! Love your post! It is great! Looks great Sheryl and great for when we are trying to avoid too much mayo! This dressing is a nice change from the typical mayo-based dressing. The black pepper is what makes this so vintage! You’re absolutely right. When I was young I didn’t care much for black pepper – now that I’m enjoying old recipes I’m rediscovering black pepper, and finding that it really adds a nice flavor to many dishes. This looks and sounds tasty. I’ve been looking for a recipe without mayonnaise. I’ll try this one. I will have to try this recipe soon. Maybe this weekend with fried chicken. It’s a nice, simple potato salad. A wonderful way to eat potatoes. I love potato salad and this is probably a much healthier version than most of today’s offerings. This is a healthier version of most potato salads and I like it. Thanks for sharing. It’s nice to hear that you enjoyed this recipe. It’s a simple, but very nice (and a relatively light) potato salad.